It sounds like a wonderfully helpful product. Do you have any invites to share? If you do, please let me know at nasteffe (AT) gmail (DOT) com. Thanks. Drop Box is terrible. I use it on one machine and it can’t recognize that I should have complete control over the files I back up. When I change a file on my local machine I want it to be backed up like that. Instead Drop Box turns the new version into something called a “conflicted copy” and now I have duplicates of all my most important files except the most recent versions have been changed to “conflicted copies” and the old versions replace the original file name. That is not cool. I am uninstalling drop box and frankly I can’t take the risk that it won’t happen again so I won’t be using it at all anymore. Thanks. Sorry to hear that, Nick. 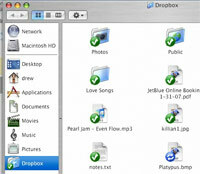 I’ve been using Dropbox non-stop since I wrote this article in March ’08 and have not had a single problem yet, which includes syncing among several machines and sharing folders with a number (10+) of friends. Of course, quirks can happen with any software and what you describe does sound pretty annoying. You should definitely report your issue to Dropbox if you haven’t already, perhaps they can help. Looking To Buy A Good Digital Camera?